BACKGROUND AND PURPOSE: Conventional CT angiography (CTA) is acquired during only a short interval in the arterial phase, which limits its ability to evaluate the cerebral circulation. Our aim was to compare the image quality and radiation dose of conventional single-phase CTA (SP-CTA) with a multiphase CTA (MP-CTA) algorithm reconstructed from a perfusion CT (PCT) dataset. MATERIALS AND METHODS: Fifty consecutive patients undergoing head CTA and PCT in 1 examination were enrolled. The PCT dataset was obtained with 40.0-mm-detector coverage, 5.0-mm axial thickness, 80 kilovolt peak (kVp), 180 mA, and 30 mL of contrast medium. MP-CTA was reconstructed from the same PCT dataset with an axial thickness of 0.625 mm by using a new axial reconstruction algorithm. A conventional SP-CTA dataset was obtained with 0.625-mm axial thickness, 120 kVp, 350 mA, and 60 mL of contrast medium. We compared image quality, vascular enhancement, and radiation dose. RESULTS: SP-CTA and MP-CTA of 50 patients (male/female ratio, 31/19; mean age, 59.25 years) were analyzed. MP-CTA was significantly better than SP-CTA in vascular enhancement (P = .002), in the absence of venous contamination (P = .006), and was significantly higher in image noise (P < .001). 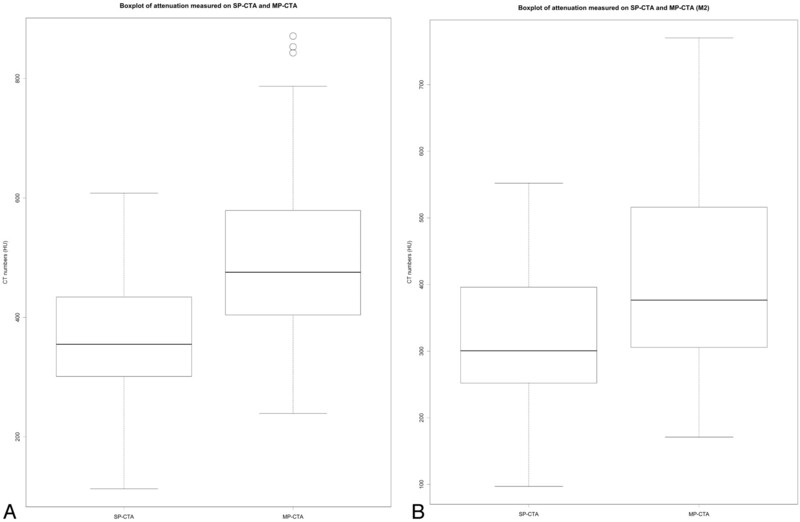 MP-CTA used less contrast medium than SP-CTA and could demonstrate hemodynamic information. The effective dose of MP-CTA was 5.73 mSv, which was equal to that in conventional PCT, and it was 3.57 mSv in SP-CTA. CONCLUSION: It is feasible that MP-CTA may provide both CTA and PCT results. Compared with SP-CTA, MP-CTA provides comparable image quality, better vascular enhancement, hemodynamic information, and more noise with less detail visibility with a lower tube voltage. The radiation dose of MP-CTA is higher than that of SP-CTA, but the dose can be reduced by altering the sampling interval. Cerebral CT angiography (CTA) is a well-established minimally invasive diagnostic procedure used to detect cerebral aneurysms, acute vascular occlusions, or vasospasms and even predicts hematoma expansion in acute intracerebral hemorrhage.1–6 Cerebral perfusion CT (PCT) is an important tool to evaluate cerebral ischemia, infarction, cerebral vascular reserve, and microvascular permeability of intracranial neoplasms.7 With PCT, the linear relationship between contrast concentration and pixel intensity lends itself more readily to quantification of blood flow values, compared with bolus contrast MR perfusion imaging.8,9 PCT generates parametric maps of blood flow, including cerebral blood flow (CBF), cerebral blood volume (CBV), and mean transit time (MTT), by using complex deconvolution algorithms.7 In a systematic review, the authors concluded that the most accurate assessment of the site of occlusion, infarct core, salvageable brain tissue, and collateral circulation in patients suspected of acute stroke is by a combination of PCT and CTA.10 Compared with the dose used for single-detector-row CT, thin-section, multidetector CT (MDCT) requires an increased radiation dose for both CTA and PCT examinations.11–13 To attain an “as low as reasonably achievable radiation dose,” many techniques have been tried to optimize radiation-dose levels in MDCT CTA. Currently, most commercialized CT scanners provide axial scanning in maximum z-axis coverage of 40-mm (2.5 mm × 16) sections; thin-thickness reconstruction modes can be scanned in 20-mm (0.625 mm × 32) sections. During acquisition of conventional CTA, only a short interval in the arterial phase is taken for reconstruction. We call this “single-phase CTA” (SP-CTA). During PCT examinations, to evaluate the area of attenuation change, we acquired axial scans of sequential images at the same level in a fixed or variable time interval (ie, multiphase mode). With the increasing scanning speed of CT, the time interval can be reduced to 0.5 second in state-of-the-art MDCT. Scanning coverage is still a problem because of the cone beam geometry in current MDCT. The fully sampled region, the region covered by every view in the scanning, is less than the cylinder, with a height equal to the detector isocenter coverage.14,15 To overcome this problem, we used extrapolation during the back projection process. The cone beam effect increases farther away from the isocenter and becomes more prominent with a larger FOV. Under such conditions, a novel vendor reconstruction algorithm has been developed to solve the cone beam effect, conducting a 40-mm beam of 64i × 0.625 mm in an axial scanning. We can then obtain raw data of thin-section PCT and perform postprocessing to reconstruct CTA from this thin-section PCT. Because such CTA images contain data from different time points, we call the technique “multiphase CTA” (MP-CTA), in contrast to conventional single-phase (SP-CTA). This study was designed to compare the image quality and radiation dose of MP-CTA by using the novel thin-reconstruction algorithm from the PCT dataset with the SP-CTA data from the same patient. All imaging procedures were performed on a 64-detector CT scanner (LightSpeed volume CT [VCT]; GE Healthcare, Milwaukee, Wis). The SP-CTA was performed with an axial thickness of 0.625 mm, 120 kVp, and 350 mA. In our study, the PCT was performed with detector coverage of 40.0 mm, a 5.0-mm axial thickness with 8 images per rotation, 80 kVp, 180 mA, and scanning intervals of 0.5 second (Table 1). MP-CTA images were reconstructed from raw PCT data stored in the VCT console by using the novel algorithm, with an axial thickness of 0.625 mm with 64 images per rotation. The scanning range of MP-CTA depended on the scanning range of PCT. The SP-CTA, PCT, and MP-CTA datasets were postprocessed with an Advantage Workstation AW 4.3 (GE Healthcare). We used SP-CTA and MP-CTA protocols for a phantom study to establish the iodine attenuation curve for the CT scanner and to compare the iodine enhancement in different protocols. A fixed field size of 20 cm was chosen for all samples. We imaged sealed plastic vials filled with 20 mL of 13 iodine concentrations (0.0, 0.5, 0.75, 1.0, 1.5, 2.0, 4.0, 6.0, 7.5, 12.0, 25.0, 30.0, and 50.0-mg I/mL) by diluting contrast medium (300 mg I/mL, Ultravist 300; Schering, Berlin, Germany) with distilled water. All contrast media solutions were prepared just before scanning to prevent sedimentation of the solution. All vials were placed separately in a tube shelf and then in the center of the CT scanner and were measured in air. CT values were measured in 5 different reconstructed sections within the vials for both scanning protocols. Multiple measurements were performed to avoid errors caused by possible inhomogeneous concentrations of the contrast media within the vials. In each section, 1 region of interest was defined as an area of 100 pixels, avoiding the outline of the lumen of the vials, and 1 region of interest in air was selected for signal-intensity-to-noise ratio (SNR) evaluation. The mean values of these 5 measurements were then compared for both scanning protocols. SNR was calculated by dividing the attenuation of contrast media in different concentrations in a region of interest by the SD in the air (noise). 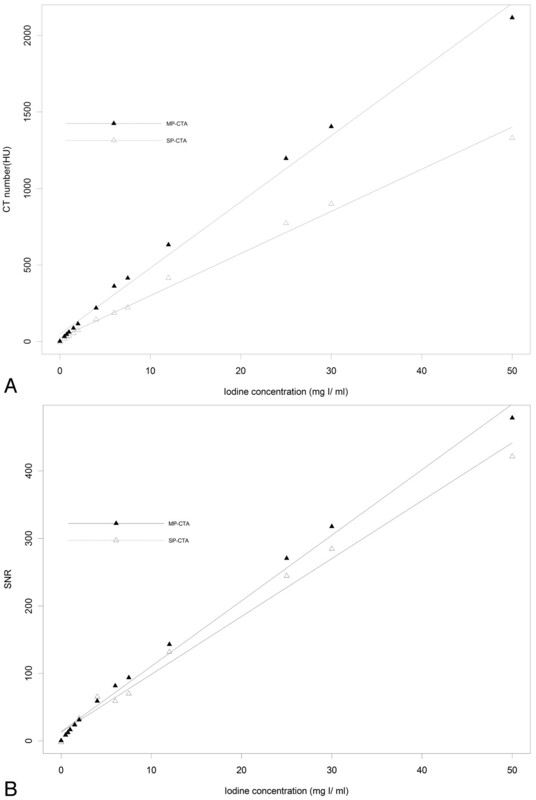 To quantify the relationship between contrast media concentration in the vials and corresponding CT attenuation, we performed a linear regression analysis and Pearson correlation coefficients between the 3 quantities. From January 2007 to March 2007, we enrolled 50 patients who were referred for suspected stroke (n = 28), carotid stenosis (n = 10), aneurysm (n = 6), arteriovenous malformation (n = 3), and Moyamoya disease (n = 3). The mean age of the patients (31 men and 19 women) was 59.3 ± 18.5 years. The study was approved by the institutional ethics review board, and written informed consent was obtained from all patients or their family members after the nature of the study had been fully explained. The standard procedure for all patients was to first perform a noncontrast CT scanning of the head, followed by a conventional SP-CTA examination. The SP-CTA scanning range depended on the clinical indication (eg, head only if the patient was evaluated for acute stroke or from neck to head if the patient was evaluated for carotid stenosis). The PCT was obtained 15 minutes after SP-CTA to reduce the residual venous contamination. During SP-CTA examination, a total of 60 mL of iodinated contrast medium (Ultravist 300) was administrated via an indwelling forearm cannula (20 gauge) with a constant flow of 4 mL/s by using a power injector (Envision; Medrad, Pittsburgh, Pa), followed by a 35-mL saline flush. CT scanning was started manually as soon as the operator identified the arrival of the injected contrast medium at the aortic arch by using the Smartprep technique (GE Healthcare). The scanning delay after contrast medium injection was recorded for reference. During PCT examination, a total of 30 mL of the same contrast medium was administrated. The flow rate was 4 mL/s, followed by a 20-mL saline flush. The scanning delay of PCT was 1 second more than that of SP-CTA. To analyze the vascular enhancement of SP-CTA and MP-CTA, the image of the arterial enhancement peak in the MP-CTA images was selected for comparison. The M2 segment is usually small in caliber, sometimes <10 pixels in 1 cross-section. To avoid partial volume effect, we measured all pixel attenuation of the M2 at the plane of the largest diameter and calculated the average of the 3 most enhanced pixels in SP-CTA and MP-CTA at the corresponding plane. We also measured at a region of interest placed in the largest normal internal carotid artery (ICA). Because some ICA bifurcations were missed during positioning in the early stage of this study, we used this measure. Region of interest was placed at the same location at the same level for both SP-CTA and MP-CTA. Measurement was performed 3 times, and the average was recorded. A paired t test was used to analyze the differences in vascular enhancement. P values < .05 were considered to indicate a significant difference. CT scans were interpreted independently by 2 board-certified radiologists blinded to the patients’ diagnoses and their clinical status. The entire 50-second MP-CTA was reviewed, and the timeframe with maximal arterial enhancement was selected. The volume covered by MP-CTA images was extracted from SP-CTA images for comparison. Radiologists used a 5-point scale to score subjectively arterial enhancement, depiction of small arterial detail, image noise, and venous contamination. 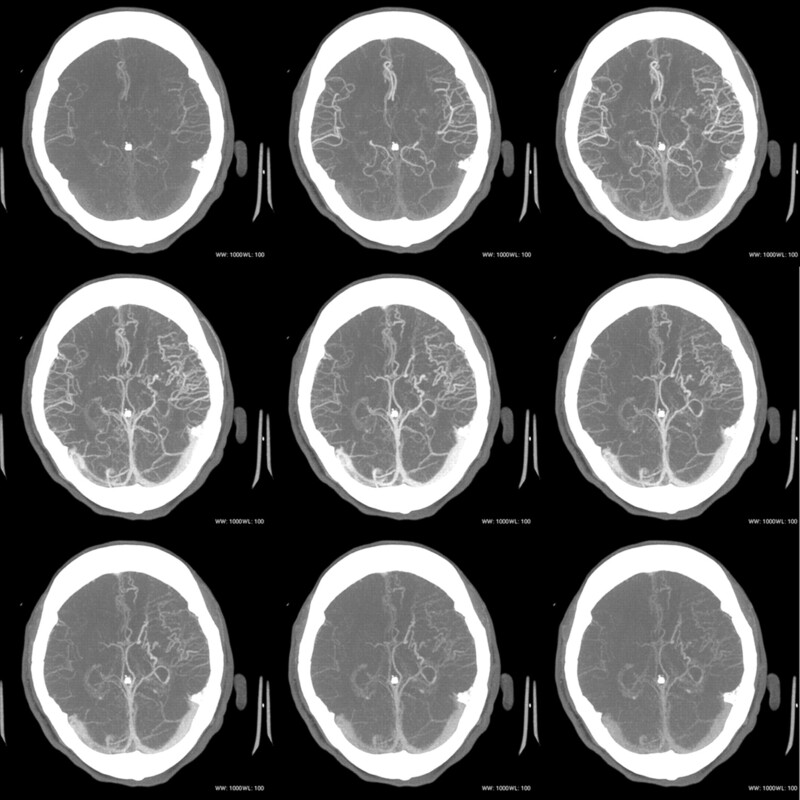 In the 5-point scale, the center of the scale (a rating of 3) corresponded to the image quality expected with standard CT angiography of the circle of Willis. A score of 1 indicated nondiagnostic image quality; a score of 2, substandard image quality; a score of 3, standard image quality; a score of 4, better than standard image quality; and a score of 5, excellent image quality. For evaluation of subjective scoring, the Wilcoxon signed rank test was used to analyze the differences between SP-CTA and MP-CTA for both observers. P values < .05 were considered to indicate a significant difference. Six circular regions of interest were placed along the periphery of each cerebral hemisphere for evaluation of CBF, CBV, and MTT. The regions of interest were placed according to the vascular territories, including the bilateral anterior cerebral artery, the posterior cerebral artery, anterior and posterior middle cerebral arteries (MCAs), and 2 anterior/posterior borderzones. The flow dynamics of vascular enhancement were also analyzed in MP-CTA. Each phase was displayed by using maximum intensity projection (MIP) reconstruction as sequential images for digital subtraction angiography (DSA), which allow readers to evaluate the dynamics of blood flow, symmetry, and delay of vascular opacification or collaterals (Figs 1 and 2). 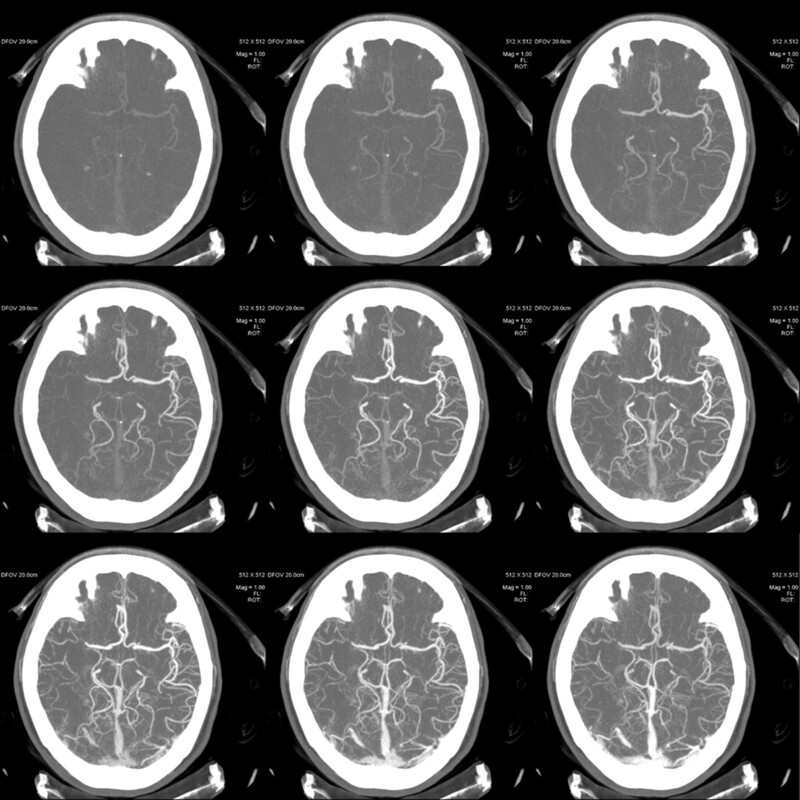 Sequential images of MP-CTA are displayed to show the flow dynamics of a patient with suggested stroke. The right MCA is not initially enhanced in the early arterial phase, and opacification of the distal branches of the right MCA via the collaterals can be appreciated later. The temporal sequence of enhancement also helps differentiate arteries and veins (window/level = 1000/100). Sequential images of MP-CTA are displayed to show flow dynamics of a case of DAVF. Increased early draining veins around the left Sylvian fissure, as well as the mildly engorged deep venous drainage, could be observed on the left side (window/level = 1000/100). On October 20, 2006, the US Food and Drug Administration (FDA) issued guidance for industry, FDA staff, and third parties for an alternate measure of the CT dose index (CTDI) to assure compliance with the dose information requirements of the federal performance standard for CT. Scanners complied with the current international safety standard for CT equipment display values of volume CT dose index (CTDIvol) on their control panels.16 We recorded the CTDIvol displayed on the control console interface for each combination of tube voltage and milliampere-second. We found a linear relationship between iodine concentration and CT value for SP-CTA and MP-CTA (Fig 3A). Pearson correlation coefficients were r = 0.996 for SP-CTA and r = 0.997 for MP-CTA (Fig 3A, -B). Attenuation in MP-CTA was 57% higher than that in SP-CTA (43.3 HU/mg I versus 27.6 HU/mg I). With an increase of noise level, the SNR of MP-CTA was still slightly higher than that of SP-CTA (Fig 3B). Graph shows CT number as a function of iodine concentration. A, The linear relationships for 2 tube-voltage settings are as follows: at 80 kVp/180 mAs, y = 43.25x + 48.05 (r = 0.997); and at 120 kVp/350 mAs, y = 27.55x + 24.00 (r = 0.996). B, The relationship between iodine concentration and SNR is as follows: for SP-CTA, SNR = 8.577 × iodine concentration +12.864 (r = 0.985); for MP-CTA, SNR = 9.704 × iodine concentration + 13.573 (r = 0.973). From the clinical scans, the peak enhancement of the largest vessel in the scanning field was 498.9 ± 130.2 HU (range, 239–871 HU) in MP-CTA and 362.7 ± 102.5 HU (range, 113–608 HU) in SP-CTA (Fig 4A). The peak enhancement of the M2 segment was 402.0 ± 147.3 HU in MP-CTA and 302.4 ± 116.8 HU in SP-CTA (Fig 4B). The average difference was 136.2 HU in the largest vessel (95% confidence interval [CI], 108.4–164.0 HU; P < .001) and 99.6 HU in the M2 segment (95% CI, 34.2–165.0 HU; P = .003). Data indicated an approximate 30% increase in vascular peak enhancement of large and small vessels in MP-CTA compared with SP-CTA. Although the noise level was remarkably higher in MP-CTA (P < .001), calculated SNRs were only slightly higher in the phantom study (P = .5956). Boxplot of arterial attenuation in 50 patients scanned with both SP-CTA and MP-CTA protocols. Error bars indicate the range of values of arterial attenuation. Boxes contain all values within the 25th–75th percentiles (interquartile range), and thick black lines represent the median. The arterial enhancement peak phase of the MP-CTA is shown for comparison. A, Boxplot of attenuation of the exact same region of the largest artery in the scanning range, representing enhancement in the large vessel. The 3 circles are outliers measured in 1 patient. B, Boxplot of attenuation of the exact same region of the M2 segment in the scanning range, representing enhancement in the small vessel. The results of image quality of SP-CTA and MP-CTA are summarized in Tables 2 and 3. No significant interobserver differences were seen in the subjective rating of image-quality criteria. MP-CTA images were rated significantly better than SP-CTA images in arterial enhancement and venous contamination (Fig 5A, -B). Quality scores increased from 3.10 to 3.70 for arterial enhancement (P < .001) and from 2.85 to 3.20 for venous contamination (P = .005) and decreased from 3.03 to 2.26 for noise (P < .001) and from 3.12 to 2.98 for visibility of vascular detail (P = 0.05). Comparison of image quality between MP-CTA and SP-CTA. A single section of MP-CTA (A), SP-CTA (B), and MIP reconstruction of MP-CTA (C) and SP-CTA (D) is demonstrated. The MP-CTA images were acquired 10–15 minutes after the SP-CTA; therefore, we could find images at almost the same level for comparison. The phase of maximal arterial enhancement of MP-CTA was selected. Higher attenuation of the vascular opacification is easily appreciated in the MP-CTA. Note that venous contamination in the SP-CTA is greater than that in the MP-CTA, which is more obvious in MIP images; and it may interfere with the differentiation of the arteries and veins. The occlusion of right MCA can be detected in both methods. The MP-CTA is noisier, and the contour of the vessels appears coarser than that in SP-CTA. All images were presented with the same window setting (window/level = 1000/100). Sequential images of MP-CTA are displayed to show flow dynamics in an MIP manner (Fig 1). The arterial flow passage, transit time, and venous drainage of the scanned level could be evaluated as well. With an appropriate selection of scanning range, the complete circle of Willis could be demonstrated. From a practical point of view, to cover all 3 supratentorial vascular territories visualized, the scanning range was usually selected starting at the level of the basal ganglia. This level was usually higher than the circle of Willis, so the complete circle of Willis in some patients could not be visualized. In the 28 patients with suggested stroke, very low CBF values (<10 mL/100 g per minute) were found in at least 1 region of interest in 8 patients in the PCT study, and moderate blood-flow reduction (15–45 mL/100 g per minute) was found in 26 patients. Findings of 2 of the patients with suggested stroke were negative on SP-CTA and PCT. 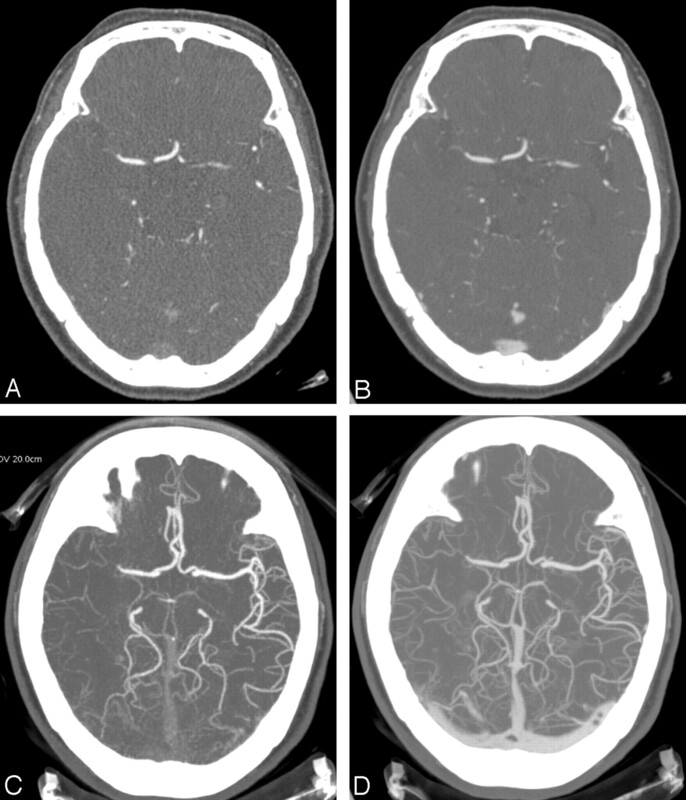 Sixteen patients (61.5%) were revealed to have either occlusion or stenosis of the intracranial vessels if the vascular lesion was covered by the scanned volume or zonal change of delayed enhancement on the MP-CTA. There were 3 total occlusions, 7 severe (75%–99%) stenoses, 1 moderate (50%–74%) stenosis, and 4 stentings revealed on the SP-CTA in the 10 patients with carotid stenosis. All of them had moderate blood-flow reduction in at least 1 region of interest. Only 2 patients were identified as having zonal delayed enhancement on MP-CTA. In the 6 patients with suggested intracranial aneurysm, all of the aneurysms were found on the SP-CTA and 3 of them were detected on the MP-CTA in the scanned volume. There were 1 cervical spine dural arteriovenous fistula (DAVF), 1 jugular bulb DAVF, and 1 DAVF at the frontal-temporal region. All of DAVFs were depicted on SP-CTA, and only the DAVF of the frontal-temporal region could be shown in the scanned volume on MP-CTA (Fig 2). In all 3 patients with Moyamoya disease, decreased CBF was detected, especially at the anterior circulation; and the small caliber and late arrival of the arterial flow could be appreciated on the MP-CTA. Our findings in the phantom study showed that with a lower tube voltage setting, we could obtain a higher attenuation along with an increased noise level in MP-CTA over SP-CTA with the same iodine concentration. With this effect, a slightly higher SNR in MP-CTA was demonstrated (Fig 3B). This result implies a similar contrast of enhancing vessel to background tissue in MP-CTA with a lower tube voltage setting as in SP-CTA. A better contrast could be yielded, after carefully choosing the maximally enhancing arterial phase. This is confirmed in our clinical study by the comparison of vascular enhancement. Peak enhancement of large and small vessels is significantly better with MP-CTA. Better contrast between vascular opacification and soft tissue will demonstrate more vivid vascular enhancement. If the sole purpose of the image study is to evaluate the vessel, a lower tube voltage setting is possible on the SP-CTA; which, in theory, will also have an increase of SNR and noise. To evaluate the brain parenchyma and soft tissue, one should not lower the tube voltage of the SP-CTA too much. The image quality between SP-CTA at different tube-voltage settings needs further study. The choice of scanning interval directly influences the total radiation dosage in the examination. Wintermark et al17 concluded that temporal sampling intervals >1 second can be used without altering the quantitative accuracy of PCT with an increase of iodinated contrast material. In a recent study, Kamena et al18 recommended a temporal scanning resolution of 2 images per second for the best detection and depiction of ischemic areas. In a continuous acquisition (cine) mode, the patient's radiation dose would be the same by using a sampling interval of either 1 or 0.5 second. At the beginning of the study, we conservatively chose a sampling interval of 0.5 second to yield the best diagnostic accuracy. With additional sampling, we could get more temporal resolution of the MP-CTA to observe the hemodynamic information. Radiation dose is a critical issue in CT studies, especially with regard to patient populations with >1 study, such as patients with vasospasms. We suggest that once the vascular lesion is determined and can be included in a 4-cm scanning range, MP-CTA is a feasible method for follow-up and provides additional information to the CTP if the scanning range is carefully selected. For patients with normal renal function, we could try to increase the scanning interval to reduce the radiation dose by increasing the contrast volume in a future study. For patients with renal insufficiency, it is better to inject less intravenous contrast medium, and more temporal resolution is necessary for ischemic evaluation. Because the lens is susceptible to radiation, the lens should not be included in the volume of interest in routine protocols. Because PCT was always performed 10–15 minutes after SP-CTA, there was still faint residual venous opacification ofthe contrast medium in the MP-CTA images. With a higher contrast of the arterial enhancement in the MP-CTA, the effect of this bias could be omitted. The qualitative results of venous contamination in MP-CTA images were rated significantly better than those in SP-CTA images. The ability to demonstrate greater contrast between vascular opacification and adjacent tissue and multiple-phase selection make MP-CTA better to delineate enhanced vessels at the right phase with less venous contamination (Fig 5A–D). The detail visibility with less noise makes SP-CTA more suitable for evaluation of areas with less contrast, for example, brain parenchyma or soft tissue. In the clinical setting with acute onset of stroke, CT is the first-line examination used to detect the size and location of the brain infarct. Conventional CTA allows the evaluation of the neck vessels to diagnose carotid stenosis in cerebral stroke, provides complete visualization of the smaller intracerebral anterior and posterior circulation vessels in minor stroke, and completes the evaluation of intracerebral vessels from the skull base to above the circle of Willis to exclude aneurysm. PCT imaging allows quantitative and qualitative evaluation of the CBV, CBF, and MTT. Combining SP-CTA and PCT creates a higher radiation dose to the patient, making this procedure controversial in the clinical setting. There are some reports that discuss optimization of radiation dosage by using lower kilovolt peak and keeping milliampere-second constant, to obtain the same image quality while significantly lowering the patient's radiation dose.13,19 One study on CTA in the brain found that image quality was worse with 80 kVp than with 120 kVp,20 whereas a similar study showed improved contrast-to-noise ratio (CNR) and vascular opacification in cerebral CTA with 80 kVp.19 Another study used 16-detector-row CT and lower tube voltage to demonstrate an improved SNR at equal radiation doses. For CTA of the circle of Willis, this translated into superior image quality at 90 kVp21 and findings that noise background increased minimally and SNR increased, but the difference was not statistically significant. In our study, we obtained MP-CTA from the PCT data obtained with 80 kVp/180 mA, because PCT is required in the clinical setting. The high-resolution images were an additional benefit of reconstruction with the novel algorithm. The image quality of MP-CTA was also comparable with that of SP-CTA (Tables 2 and 3). The overall radiation dosage of the perfusion CT is still greater than that with SP-CTA. Less dosage from the perfusion CT could occur if the temporal sampling intervals of the PCT increased by adjusting the contrast volume, which would not alter the quantitative accuracy of the PCT.17 For example, we can reduce the radiation dose of the PCT by a factor of 4 if the cine time becomes 2 seconds. In repeated scanning, even in a routine PCT study, careful selection of the volume of interest to avoid scanning the lens is important because the lens is sensitive to the radiation dose. On MP-CTA, the detection rate of the vascular lesion or delayed enhancement was 61.5% for ischemic stroke and 20% for carotid stenosis. The delayed enhancement was most obvious if there was a large difference between vascular territories. In a case of bilateral carotid stenosis, for example, we might not detect the asymmetry of arterial enhancement of the carotid arteries because the arrival of blood flow was delayed for both sides, not just on a single side. This might partially explain the low detection of ischemic areas in this study, because 7 of the 10 carotid stenoses were bilateral. Two of the 3 total occlusions of the carotid arteries were detected on MP-CTA. This may be due to chronic compensation of collateral circulation from the opposite side and posterior circulation. There was only 1 patient with DAVF, in whom the lesion was in the scanned volume of the MP-CTA. The increased early enhancing draining veins could be found in the display of sequential phases (Fig 2). For cases of arterial aneurysm, MP-CTA detected the aneurysm well if the lesion was covered. The ability to depict the diminished major intracranial vessels, increased collaterals, and zonal delayed enhancement in Moyamoya disease was good. MP-CTA could detect the vascular change mentioned previously in all 3 patients in our study. Because the ability to depict vascular detail and detect delayed enhancement was limited in the scanned volume, it is more suitable for MP-CTA to be an adjuvant study to the nonenhanced study, SP-CTA, and PCT in the initial screening. There are some potential uses for this technique. For vasospasm after subarachnoid hemorrhage, which needs morphologic evaluation of the small vessels, the ability to depict the vascular detail maps makes MP-CTA an option. The increased noise in MP-CTA is a concern because the vasospasm is sometimes difficult to detect even on SP-CTA. Because perfusion maps could be generated with the PCT study, they may help determine the location or severity of the vasospasm. Another possible application is to determine whether a stroke intervention (intravascular thrombolytic therapies such as tissue plasminogen activator or mechanical embolus removal) has been successful in recanalization and reperfusion. Because the vascular lesion was determined in the initial screening, precise location of the scanned image could be carefully selected in the follow-up MP-CTA study. The hemodynamic change might be appreciated by comparing the MP-CTA images before and after treatment. Many studies can be found assessing MDCT aortography, but, to our knowledge, very few exist in cerebral CTA. Studies done with 16-detector MDCT aortography22,23 showed that a low-dose contrast medium protocol for aortography is feasible. Although SNR and CNR were significantly higher in the high-dose protocol, qualitative evaluation of graininess and streak artifacts showed no statistically significant difference. Interobserver agreement for quality assessments was within an acceptable range. The authors found low-tube-voltage scanning with low-dose contrast media to be appropriate for smaller patients (<70 kg in body weight).22,23 It is reasonable that a low contrast medium protocol is also feasible in a small body part such as the head. In our study, the intravenous iodinated contrast medium totaled 60 mL during SP-CTA scanning, but only 30 mL for the PCT/MP-CTA study. With less contrast medium plus a low-tube-voltage condition, MP-CTA produced stronger vascular enhancement than SP- CTA if the right phase of enhancement peak was chosen. This is especially meaningful in patients with impaired renal function because a comparable quality of CTA images can be obtained with less volume of contrast via proper scanning level and phase selection. Normally, conventional DSA is performed with single-vessel injection. With this method, only a specific vascular territory is selected to be enhanced in sequential time order; and for each plane position, only 1 or 2 images are acquired. With MP-CTA, however, we could virtually perform a simultaneous 4-vessel injection to evaluate the overall intracranial circulation in the scanned volume phase by phase. Different reconstruction methods could be used to evaluate the scanned volume, including MIP, surface rendering, volume rendering, or subtraction. This provides a promising method for hemodynamic analysis, especially in the future as the scanning volume increases. Because PCT was acquired in the axial cine mode, repeated acquisition was performed in the chosen level. During the examination, a time series of images at the same level was obtained. Sequential images from the arterial phase to the venous phase could be retrieved for further analysis in MP-CTA. Sequential images could be displayed to show flow dynamics (Figs 1 and 2) as in DSA. It is easy for readers to evaluate the symmetry of major intracranial arteries for prolonged MTT, inadequate arterial flow, and development of collaterals. Images in the venous phase can also be reconstructed for venous anatomy and anomaly analysis, such as in patients with suggested dural sinus thrombosis. The limited 4-cm range of single-axial scans in current PCT is a disadvantage in screening for small vascular lesions not located inside the scanning level. With the development of CT scanners, a wider range can be scanned at 1 time and a more complete study achieved. In clinical practice, at the beginning of the assessment of neurovascular disease, a scanning range from neck to head is necessary to complete the evaluation, which makes MP-CTA not sufficiently comprehensive in the initial screening. Once the vascular lesion is determined by previous examinations such as CTA, MR angiography, or DSA, especially for lesions at the circles of Willis, a 4-cm scanning range of MP-CTA could be a substitute for conventional SP-CTA. In follow-up studies when a perfusion study is necessary for ischemia evaluation or when the patient is in renal insufficiency, such as with MCA stenosis, MP-CTA substitution is an option. If the vascular pathology was not included in the PCT volume, a separate CTA run with contrast and radiation dose would still be necessary. In conclusion, with a lower contrast medium dose, this novel algorithm uses the series of source images generated for perfusion CT to create a limited CTA over the region studied. The radiation dose can be reduced by increasing the sampling interval in MP-CTA. It provides comparable image quality, better vascular enhancement, hemodynamic information, and also more noise with less detail visibility with a lower tube voltage. MP-CTA is a promising alternative for evaluating neurovascular diseases. This work was supported in part by grants from National Taiwan University Hospital (97-M1034). Accepted after revision February 2, 2008.